The Thompson Family - The only existing photo to date. Special Containment Procedures: Due to SCP-1950’s effect, a warehouse has been constructed with a further twenty meter (20) allowance for any unforeseen addition to its effect. Security cameras and motion detectors are set up around the facility to alert of anyone approaching the warehouse. Two armed security personnel are to be on duty at all times. No one is allowed to interact with SCP-1950, and any personnel or intruders that do so are considered part of the SCP, their position is to be noted, and the effect diameter adjusted accordingly. Thermal imaging suggests there are four individuals in the house. These are believed to be the Thompsons. SCP-1950-1, believed to be Mr. Thompson, is in the basement at a very hot object (the probable cause of the explosion). SCP-1950-2, Mrs. Thompson, can be seen through a window into what is believed to be the kitchen. SCP-1950-3, dubbed Junior Thompson, is seen walking through the kitchen toward the screen door while stating something to Mrs. Thompson. A toddler, SCP-1950-4, is in a cot in the first floor bedroom. Due to SCP-1950 anomalous properties, further inspection into the house and basement is limited by the view from perimeter of its effects. 0-1s: SCP-1950-2 is washing up dishes at a sink in the kitchen. She remains at this position the entire time. SCP-1950-3 enters the room. SCP-1950-1 makes a rapid motion as if to throw something. 1-2s: 1950-3 moves through the room, and briefly converses with the 1950-2 as he moves to the backdoor. 1950-1 begins to move rapidly towards the stairs. 2-3s: 1950-3 begins to open the door. 1950-1 ascends half the stairwell. 3.5-4s: An explosion that originates from the basement rips through the house, with large fireballs breaking through every window. There are no survivors. The explosion reaches approximately two (2) to four (4) meter out before the loop rewinds at the same speed. (The entire time loop is therefore 8 seconds long). Any and all interaction with SCP-1950 adds to the effect diameter (which currently stands at forty meters (40) at the epicenter of the explosion). Should anyone or anything cross the effect diameter during the four seconds, they will be caught in a four second time loop that will rewind at the climax. Should someone approach the house at the two second marker, for example, at the point of the explosion they would rewind back four seconds, even if the beginning of their four seconds was originally outside the previous effect diameter. This essentially adds to the effect diameter, and the distance of effect is considered to have increased to the object or persons position at their initial four second start point. SCP-1950-1– Mr. Thompson - The appearance of Mr. Thompson is limited to the size of the windows into the basement. He is a Caucasian male, approximately thirty (30) to forty (40) years old, of medium build and about 180 cm tall. SCP-1950-2- Mrs. Thompson – is Caucasian female, approximately 175 cm. She is wearing a floral red and white dress, with matching circular earrings and hair band. Her makeup is immaculate. SCP-1950-3- Junior Thompson – is a young Caucasian male, approximately four (4) to six (6) years old. He approaches the backdoor with a baseball bat, catching mitt and ball, wearing denim dungarees and a backwards baseball cap. SCP-1950-4- A female toddler approximately two (2) to three (3) years of age, wearing a pink night outfit and bow is asleep in the master bedroom. 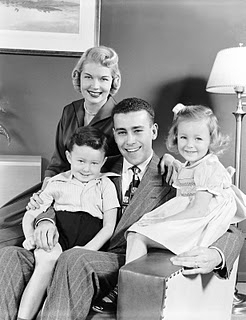 Researchers notes – It appears that the family is typical of a 1950s style era. The interior and family structure, from what we can see, is very stereotypical of a ‘nuclear’ family, a housewife, a father, and two kids – the elder being an older brother. The interior is bright and colorful, with many appliances familiar to a 1950s household. It suggests this event has been playing over for the last sixty years. It is surprising that no one has discovered or interacted with it sooner, which is a blessing in disguise. And as peculiar as this is, it doesn’t bring us any closer to how it keeps repeating itself. The only thing this is useful for is being able to set your watch to it. Further research is ongoing into who the Thompson family were. A search through census records of the local town puts a Thompson Family at 149, ███████ Ave. and contained the archived photo. No other records pertaining to the family or events of that time are known to exist.